Anchor point One dorsal D-ring and one chest attachment D-ring. 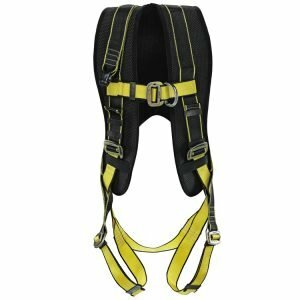 Special features Innovative lightweight design Extra comfort throughout the neck, shoulder and back Breathable open-core padding technology Easy no-tangle donning Integrated extension lanyard 500 mm long Built-in fall indicator for easy inspection Sub-pelvic straps stays low and comfortable. Materials Fray-proof dope-dyed polyester webbing Metal buckles of high strength steel alloy. Stitching High-strength polyester and computer-controlled stitching ensures consistency. Adjustability Size adjustment straps at chest, shoulders and thighs. Standard Conforms to EN 361.